Cascade Brewery in Hobart, Tasmania. Cascade Premium Lager is one of the most awarded beers in the country and has been named Top Premium Beer in Australia. 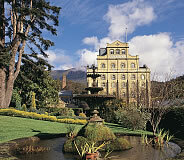 The Cascade Brewery in hobart, Tasmania, with its instantly recognisable façade, sits at the base of Mt Wellington from which it sources the uncontaminated waters that help to create the smooth, full flavour of the beer. Cascade Brewery was started by Peter Degraves in 1824. Cascade beer rose steadily in popularity and became the colony’s premier beer by the 1850s. This was no small feat – competition was vigorous. In 1850 Tasmania boasted 48 breweries. In 1985 the Cascade Brewery decided it needed a beer which could compete in the rapidly growing premium and imported beer market. Assessing the findings of a number of tasting panels they determined that the primary means for creating a superior beer were an increased period of maturation and the use of premium quality malt. Cascade Brewery already had some of the world’s best water. The normal maturation time for lager was increased from three to six weeks to bring out more flavour. The malt used was the best Tasmanian-grown barley, malted by the Cascade Brewery itself. The quality hops are locally produced. Cascade Premium was officially launched in June 1987 with a marketing slogan of “Pure Beer”. By December the Melbourne Herald voted it Australia’s best beer. In 1990 Cascade Premium won a gold medal at the prestigious Monde Selection in Brussels. Cascade Brewery is Australia’s oldest continuously operating brewery. It has been around since 1824 making it also Australia’s oldest manufacturing enterprise. Cascade is unique among Australian breweries, and rare among breweries worldwide, in that it operates its own maltings, producing malt for its mainstream beers from locally grown barley.